Sen. Jeff Sessions testifies before the Senate judiciary Committee on his nomination to be attorney general. Washington – Sen. Richard Blumenthal provoked one of the liveliest exchanges in the day-long confirmation hearing of Sen. Jeff Sessions, President-elect Donald Trump’s choice for attorney general, by pressing him on his links to controversial groups who have given him awards. At the hearing Tuesday, Blumenthal asked Sessions why he accepted the Franklin Society Award from the Federation for American Immigration Reform, whose founder John Tanton said he hoped the United States would keep a majority white population and has made other racially insensitive remarks. Blumenthal also questioned Sessions’ relationship with David Horowitz, who has been praised by Sessions. The Alabama senator also received the David Horowitz Freedom Award. “I did not know David Horowitz had made such comments,” Sessions replied. Sessions retorted that former Connecticut Sen. Joe Lieberman also received an award from Gaffney. Blumenthal said Sessions did not list these awards when he filled out his questionnaire to the Senate Judiciary Committee, which had asked for this information. Sessions, 70, was the first of Trump’s nominees to undergo a confirmation hearing. He faced tough questions from Judiciary Committee Democrats Tuesday about his record on civil rights and immigration. The hearing was frequently interrupted by protesters. A coalition of about 400 civil rights, immigrant and human rights organizations, 1,400 law professors and about 70 reproductive health groups oppose Sessions’ nomination. Earlier in the day Blumenthal asked Sessions if he would appoint a special counsel if Trump or his family members were accused of breaking the law. Blumenthal continued to press him on whether he would appoint an independent prosecutor if there is evidence Trump violated the emoluments clause of the U.S. Constitution, which prohibits a president from having financial conflicts of interest involving foreign governments. “We would have to examine that. I would not commit at this time to appointing a special counsel when I’m not aware of the precise factual situation that would be in play,” Sessions said. Blumenthal also asked if Sessions would appoint a special counsel if Trump’s children violated the Stock Act, a law that punishes lawmakers and federal officials who engage in insider trading. “We’ll have to evaluate that. If such a circumstance occurs, I would do my duty…,” Sessions replied. Sen. Richard Blumenthal questions Sen. Jeff Sessions during Sessions’ confirmation hearing. Displaying an Operation Rescue poster of George Tiller, a Kansas doctor who performed abortions and was murdered in 2009, Blumenthal asked Sessions, who is pro-life, if he would enforce federal laws aimed at protecting abortion clinics and their doctors. Sessions said he would. He also said he would enforce federal gun control laws, but said making FBI background checks “universal” may not make sense. Blumenthal also asked Sessions if he would recuse himself from the Justice Department’s investigation of Deutsche Bank, which has loaned Trump hundreds of millions of dollars. Blumenthal also asked if Sessions, a member of the Senate Judiciary Committee, would recuse himself from voting on his own nomination and that of other Trump nominees. “I do not have plans to vote on my own nomination,” Sessions said. He also said he might have a conflict of interest if he voted on other Trump nominees. 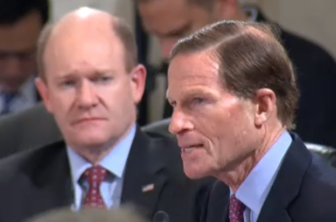 “I know if you were sitting here, you would be tough on me,” Blumenthal said. On Tuesday, CT Students for a Dream urged Blumenthal to vote against the nomination. The group represents youths who were brought to this country by their parents without documentation. President Obama has used his executive authority to give temporary legal status to youths who qualify under the Deferred Action for Childhood Arrivals (DACA) program, but that move has been opposed by both Sessions and Trump. “Senator Sessions is well known as one of the staunchest foes to immigrant rights, and his confirmation would pose a threat to my existence and countless communities,” said Camila Bortolleto, policy coordinator for CT Students for a Dream. Bortolleto and her twin sister were brought to the United States from Brazil 18 years ago. Sessions said he would enforce immigration laws passed by Congress, but said “a cycle of amnesty” hurts the nation. 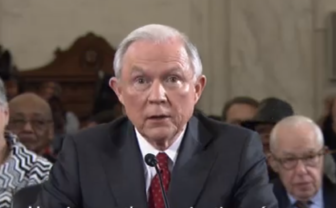 In his opening statement, Sessions expressed empathy for the civil rights struggles of African Americans and said he had fought the Ku Klux Klan in Alabama. “The characterization of me in 1986 is not correct,” Sessions said. He said he would crack down on violent crime, and his testimony echoed Trump’s nomination speech by saying there are increases in violent crime in some areas of the country. He said the United States might be at “the beginning of a dangerous trend” that could make it less safe. “It is a fundamental civil right to be safe in your homes and communities,” Sessions said. But the Democratic staff of the Judiciary Committee, which received an embargoed copy of Sessions’ testimony on Monday, was ready to rebut key points Sessions pressed, including his citing of crime statistics and claim of rising crime. In a release, the staff said the FBI has determined that all crimes decreased 1.8 percent between 2014 and 2015. “Also, while some cities have experienced a recent rise in violent crime, others experienced a decrease, and overall national crime rates are still at historic lows compared to peaks in the 1980s and 1990,” the Democratic staff said. Acknowledging his comments on the campaign trail about the issues, Sessions also said he would recuse himself from any Justice Department investigations of Hillary Clinton’s email practices or her family’s charitable foundation. “We can never have a political dispute turn into a criminal dispute,” he said.